It was afternoon, in the middle of hectic shooting for the Hindi movie “Teen Sau” , that I caught up with director Anil Sharma and Sunny Deol. Resting underneath two mammoth umbrellas and with a Patiala peg in their hands, the atmosphere was most relaxed, once you overlooked the trickle of blood flowing down Sunny Deol’s upper brow and the fragments of human bone and flesh that seemed to cover his knuckles. ” So Mr. Anil Sharma, how did “Teen Sau” come about?” I asked. Sunny Deol smiled and interrupted. “Let me tell you. This was just after the release of my movie ‘Big Brother’ where I played a violent man called Gandhi who buried people in the sand with just one blow. Having vanquished all villains, I was looking for creative new ideas when I chanced upon this “changa” film: ‘300’ “. “Of course not. How could I? It seemed to be inspired by our movie ‘Gadar’. This hero, who was playing what’s his name, King Lion Dass or waise kuch, was totally copying my acting style, the ceaseless bellowing of “This is SPARTA” and the snarling and growling dialogue delivery in the battle of Kitply reminded me so much of ‘Gadar’ where my manly screams made the Pakistani army piss in their trousers, that I thought to myself more than once ‘Is this actor my twin brother’? Herodotus maango to Socrates denge, Sophocles maango to cheer denge. As Sunny’s brow knitted, I realized that maybe I had said too much. “Of course. I mean if it was not political, Guddu Dhanoa would be doing it. In ‘Teen Sau’ we have an indecisive Prime Minister played by Ak Hangal in a turban who, even when his country is under attack, does nothing but say: We are all brothers under attack. Angry at this pandering to the enemy, the brave Colonel Journal Singh (Sunny Deol) rounds up an army of three hundred brave Jatts and marches upon Pakistan where the Emperor Mushex, the God-king, has assembled an army the likes of which noone has ever seen: an squadron of fighting rhinocerous led by Inzimam, mutant ninja turtles, Afghani mujahideen with AK69s, a battalion of mujra dancers moving to “Meri phullon wali kurti” and a clone army of Arundhuti Roys. Yahan pe hum karenge ! Aur yahan pe woh marenge! Spartan King Leonidas: Spartans! What is your profession? Spartan King Leonidas: See old friend, I brought more soldiers than you did. Jarnail Singh: Nau jaowanon, tumhara kaam kya hain?.. Extras who will die soon: Harooh! Harooh! Harooh! Sunny said: “Of course not. Firstly we wont have leper priests —- too costly to get them from Kolkatta: after doing “City of Joy” their rates have become astronomical. Special effects will have a different feel: the guy who did FX for my movie “Nigahen” is in charge of that. Plus of course music: plenty of Bhangra and ‘Number 1 Punjabi’ and ‘nikla oh gaddi leke’ in between battle scenes and screaming matches. One of the crew boys came running. Sunny and Anil Sharma got up as the romantic ditty”Pyaar mujhe tum karti ho, Don’t say NO” began playing. Taking this as my cue to leave, I slipped away, content in the knowledge that it’s not everyday one get to see history being manufactured. And it is not everyday that sound and fury is meant to signify something. Interestingly, General Tikka Khan (1965 Indo-Pak war fame) in his days from the other side, actually believed what Jutta Sunny is showing in “teen sau”. Tikka is said to have told his soldiers (when he was the Corp Commander of Lahore), that every Muslim soldier is equivalent to ten Kafir soldiers. Surprisingly, he managed to pull off a Thermopylae at Battle of Chawinda and repulsed the Indians from Sialkot. Eh? Sunny Paaji as hero. Sounds incredibly exciting. And pray, how about Mithunda essaying the role of Mush-ex? A fully tatooed Mithun with bangles in ears and nose would be worth dying for!!!! i just hope he doesnt start dancing. that alone would kill the whole army. His Dancing on the mountains there caused major landslides and avalanches..
Cant recollect the movie/song but he stomps away to glory in front of Juhi Chawla…. I vote for Chunkey Pandey in the role of henchman of Mithun-da. Umm. nice interview, but can you please answer the following questions? 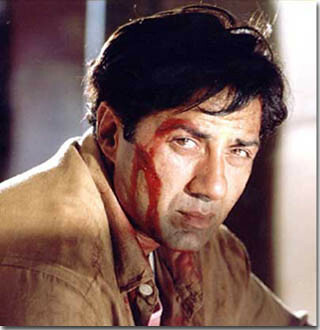 – Its one thing to see Sunny Deol spouting those fiery lines. But how many of us have the heart of seeing him in leather briefs, fighting with a trishul? A suggestion, replace the brief with a dhoti. – Will there be any dances in this movie? As if Sunny Deol in briefs was not enough, now we have to see Sunny Deol in briefs wiggling like a penguin? – Who’s playing Xerxes? If the casting hasn’t been complete, may I suggest Bobby Darling? 300 was so highly recommended to me – I thought it would be another Gladiator. Uff.. just a bunch of WWF wrestlers screaming. Goes to prove that just outstanding SFX’s and stunning action sequences don’t make a movie watchable. Riot of Laughter.Jeeyo GB. I just hope that Anil Sharma doesnt get inspired after reading this post and seriussly goes in for making Teen Sau. What a torture it will be!!! Nice…different type of review. But then such a bad movie like 300 does not deserve a serious review. Cheers. “Intimidation is the best form of flattery”. Heh Arnab. What an intimidating writer you are!. Luv. @ rishi: It was not Tikka who said that but Ayub Khan. Chawinda was a stalemate, Pakistan Armor gave an excellent account of itself in the battle, it was led by Col Nisar. Chawinda was not a stalemate as India claimed. India’s first armoured division was mauled and forced to withdraw. Thankfully Asal Uttar made up for it. Wicked is the word. This is precious especially the ‘Intimidation is the best form of flattery’. Thanks for some laughs in a dreary, dreary week. Really nicely done. Ek teer se do shikar…. LOL. Intimdation is the best form of flattery-love it! Just like Sharmilla Tagore saying on NDTV, if there are rules, why flaunt them? I think the plot of “300” is quite close to another Sunny Deol epic, “Border”. A small group of soldiers take up a strategic post to ward off a numerically strong enemy while they fail to get reinforcements from the higher authorities. What do you think? Of course, it ends differently with Sunny Deol running into the enemy tanks like a battering ram and dropping grenades into them, as if he is distributing laddoos on his sister’s sagaai! But the histrionics, the “warrior values”, the over-the-top innuendo are all the same. Considering that the plot was inspired by a real life incident, are we looking at Frank Miller being ‘inspired’ by our very own JP Dutta? I personally think 300 is an average film. It looks spectacular but as a screenplay it has none of the depth, texture and that superb control of craft (while paying a homage to another art form) of Sin City. @GB: Have u heard about the film Tulkalam with your favorite hero Mithunda? This is a political movie regarding the land grabbing of West Bengal namely in Singur and Nandigram where Lenin, Stalin and Marx is quoted in a filmy manner!!!!! It is a story of land grabbing in the name of shilpayan and the story of tortured wives, misery of villagers, greedy politicians, greedy policemen and finally of Mithunda the savior! Well, with me giving u the story line and with ur imaginative power I donâ€™t think u need to watch the movie for a review!!!! ’twas dimwitted.. GB you have come up with lot better pieces than this..hmfff!! I came to this site to read about your take on the hype created by rediff about the wedding of Jaya Bhaduri’s son and a former miss India. must say was not as near impressive as ur other posts…the point u were trying to lay seemed rather lost in ur “efforts” to squeeze in humor….more slapstick than subtle..
Usual GB gems of wit missing in this one… although Sunny is the perfect/only Indian veera who can match Spartan virility sperm to sperm (veerya=sperm). Good choice, GB. Btw, I guess Sunny Deol is eka-i ek-sho, and so 200 Jatts would be enough. Pls GB, I have a request…Pls pls post a review on the movie ‘Hateem thai.’as it is, its a hilarious film, but i want to read a review of the same written by the Great Bong…you rock!! Carrying on with my proposal of using just 200 Jatts: not only will the change make the Hindi script an absolute original, it could actually render many innovations much more manageable. For instance, based on a well fed diet of rajma and chana, the most primitive and cliched hand-to-hand combat strategy may be creatively phased out. Some well-directed balle-balle ballistics would make ‘Teen Sau’ infinitely more original and, inshallah, real intense. Hey…have sent you an email regarding Indibloggies and it might be stuck in your spam folder. Pls check and reply. tulkalam is the movie which has dialog like ” publiker maar, keoratolar paar”… wanted to watch it while on vacation recently… sadly holo na..
arnab, slightly sticky post, but the case is 300 is pointless to review..the CGI kills the movie. But, all the same, the parallels are admirable. Come down to India, and have a open house of your blogs, U know like story reading types.. Mayb you can think of publishing a compilation of ur favorites..
Crap movie; wasted 30 bucks! You know what? I hope he does make Teen Sau! What fun that’ll be! I think this was to emphasize how Punjabis, and the whole of India, for that matter, refers to Kolkata. I nearly once missed my flight from Chennai to Kolkata, as I was busy pointing out to the Airport Manager that, just because Chennai has a double ‘n’, doesn’t necessarily means there’ll be a double ‘t’ in Kolkata, on the display boards. Suuny is my always fav. He is really a nice person. thanks for this post.